Eleven Years Ago: December 26, 2004: Indian Ocean Tsunami. Why did the Information Not Get Out? Was There a Hidden Agenda? Why was this information withheld regarding one of the most serious seismic events in recorded history? According to Columbia University’s Earth Institute the M-9.0 Sumatra – Andaman Island earthquake on December 26th released energy, equivalent roughly to 700 million Hiroshima bombs. Seismic information regarding what scientists identify as a “rare great earthquake”, was available in near real time (i.e. almost immediately) to seismic centers around the World. The tsunami was triggered within minutes of the earthquake, prior to the release of the first tsunami advisory bulletin by the Pacific Tsunami Warning Center (PTWC) in Hawaii, so it was no longer a question of emitting “a warning” of an imminent danger. The catastrophe had already happened. “If it were a 9 earthquake … with the thrusting in an ocean basin margin, the likelihood is almost 1:1 that it would generate a tsunami” (Dr. Charles Groat, Director, US Geological Survey in testimony to the Science Committee of the US House of Representatives, 26 Jan 2005). The data regarding the magnitude of the earthquake originated from four seismic stations located in the Indian Ocean, operated by the International Deployment of Accelerometers (IDA) Project . In other words, the US military base at Diego Garcia , with its advanced monitoring facilities, research labs, etc. was not the “recipient” but rather “the source” of the relevant data regarding the earthquake. The US has an advanced “spy satellite” system, with very precise capabilities of monitoring the terrain, including changes in the natural environment, not to mention moving objects. The National Reconnaissance Office (NRO), which was responsible for launching the first spy satellites of the Cold War era operates a sophisticated system of reconnaissance satellites, which transmit imagery and other data in real time. Another key US body, involved in satellite imagery is the National Geospatial-Intelligence Agency, (NGA) , formerly known as the National Imagery and Mapping Agency. The latter was in fact the architect of the global positioning system (GPS), which was conducive to creating a system of global geospatial intelligence (GEOINT). In other words, state of the art satellite imagery (available to military, intelligence, civilian as well as private commercial entities) provides “a real time set of eyes”. With regard, to the M-9.0 tsunami of December 26, satellite images were available almost immediately. The US military confirms in this regard, that it has access from its satellite systems “to vital intelligence in real time”. These real time images were used extensively in the Iraq and Afghan war theaters. (Hearings of Sen Armed Services Committee, 25 Feb 2004). While “before” and “after” images of the disaster have been made public, the images which show the progress and movement of the tsunami, in the period immediately following the earth quake have not been released. More than a quarter of million people have died in one of the World’s most devastating natural disasters. Indian Ocean Tsunami. Why did the Information Not Get Out? Why then in the case of a M-9.0 earthquake, which is more than ten times greater in magnitude than a M-7.9 earthquake, did the PTWC authorities fail to even issue a tsunami warning? An event of this type and magnitude is known as a “megathrust,” which in its specific Indian Ocean location is said to occur “approximately every few hundred years.” (See Columbia University Earth Institute ). Moreover, both official and news reports out of Aceh province, following the disaster, were either delayed or were not transmitted on time. In other words, despite the dramatic nature of the quake, the seismic information, which was available in real time, failed to reach the countries affected by the seismic wave. Why were the countries not informed of an impending disaster? A few press reports, nonetheless, confirmed that, with the exception of Indonesia and Australia, the Indian Ocean countries had not been informed. These same reports, largely based on statements of the Pacific Tsunami Warning system (PTWC) in Hawaii, also acknowledged that the US State Department and the Military, including the US Navy base on the island of Diego Garcia in the Chagos Archipelago had been duly notified. In retrospect, however, these earlier press reports (including our own analysis ) need to be qualified. Published in the immediate wake of the disaster, they quote official statements to the effect that the US government and military had been informed by the PTWC, when in fact the PTWC was on the “receiving end” of the flow of seismic data. (See Foreknowledge of a Natural Disaster , Richard Norton Taylor, US island base given warning: Bulletins sent to Diego Garcia ‘could have saved lives’, The Guardian, Jan 2005). Upon closer examination, the PTWC bulletins are but the tip of the iceberg: The information on the quake was known and available in real time, to an entire network of seismic organizations. It was also on hand and accessible to a number of government agencies both in the US and internationally, almost immediately. Numerous officials, scientists, members of the military and intelligence services, had advanced knowledge of an impending disaster. The question is not why the PTWC did not emit a tsunami warning but why did an entire global network of scientists and officials not emit a warning, in relation to one of the largest quakes in recorded history. While the PTWC had indeed formally notified Washington and the Military at the Diego Garcia island base, the US government and military already knew, because the seismic data had been processed within minutes by an agency under the jurisdiction of the US Department of the Interior, namely the National Earthquake Information Center (NEIC) based in Golden (close to Denver), Colorado. The seismographic data did not originate at the PTWC, which is part of the Weather Service of the National Oceanic and Atmospheric Administration (NOAA) under the jurisdiction of the US Department of Commerce. The seismic data was recorded both within the Indian Ocean region and around the World by a number of stations, relayed to a network of seismic centers in a number of countries. (see below). In other words, omissions and failures in the warning system, not to mention red tape, were by no means limited to the PTWC, which is integrated into a global information network which records, processes and transmits seismic data in near real time. Several key organizations (including the Earthquake Information Center World Data Center for Seismology, Denver (NEIC) and The European Space Agency (ESA) among others, are part of this network, and could have duly advised the countries concerned. Where did the seismic data originate from? This issue, which is crucial to understanding the flaws in the seismic warning system, was barely mentioned by the media. 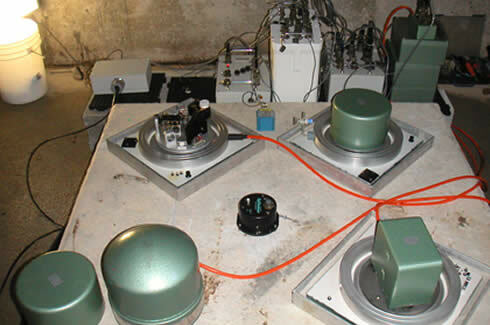 The data regarding the magnitude of the earthquake originated from four seismic stations located in the Indian Ocean, operated by the International Deployment of Accelerometers (IDA) Project . The Scripps Institution Of Oceanography (SIO) at the University Of California at San Diego overseas the IDA seismic stations. “Due to their proximity to the event, IDA stations were critical in the early detection of the December 26th earthquake. The two closest global seismic stations, IDA stations on Cocos (Keeling) Island and Sri Lanka, received signals three minutes, thirty seconds after the quake began. Data from these and other IDA GSN stations in the region were used by the NEIC, and other civil, academic, and military systems to quickly determine the quake’s size and location.” (Statement to the Science Committee of the US House of Representatives, 26 Jan 2005. emphasis added). Seismographic data was transmitted in real time from the four IDA Indian Ocean stations DGAR (Diego Garcia), COCO (Cocos [Keeling] Islands , PALK (Sri Lanka), and MSEY (Seychelles) to both the IRIS and NEIC centers, where they were then immediately retransmitted (in real time) to the PTWC as well as to other agencies and organizations. The latest station in the network established in Feb 2004 is Diego Garcia, DGAR. In other words, while the press reports acknowledge that the Diego Garcia island military base was formally notified of the dangers of a seismic wave, what they failed to mention was that part of the seismic data used by the PTWC to justify its advisory had in fact originated in Diego Garcia, and that the data from Diego Garcia (together with that of three other Indian Ocean stations) had also been transmitted to the IDA/IRIS and NEIC networks. The seismic recording equipment installed in the underground vault. The sensors rest on the central pier, which is directly attached to the coral that underlies the vault so that the instruments can best record the shaking caused as seismic waves travel through the earth. While DGAR was established with the cooperation of the US military, it is categorized as a civilian scientific facility. The later uses the island’s military base’s communications facilities to transmit its seismic readings to the IDA/IRIS center in Seattle. Whether the seismographic readings from DGAR were directly available to military personnel on location at Diego Garcia at the GEODSS facility is not known, although the Diego Garcia military authorities would most probably have near real time access to the seismic data monitored by NEIC and other seismic centers, which are hooked up to the Military. In other words, in all likelihood, the US military had the relevant data on their computer screens within minutes of its transmission. In addition to the IDA/IRIS stations, the International Monitoring System (IMS) of the Preparatory Commission for the Comprehensive Nuclear-Test-Ban Treaty Organization (CTBTO) based in Vienna, operates several stations in the Indian Ocean region, three of which are in fact located in the Chagos Archipelago (British Indian Ocean Territory). (See map below) Two of these stations are situated directly on the site of the US military base. In other words, there are in all four stations in the Chagos archipelago, which use the communications system of the US military base. The IMS confirmed that it recorded the December 26th earthquake at 78 of its stations, including those in the Indian Ocean in near real time, “within seconds to minutes of the event.” (of the 78 IMS stations, 71 were using the seismic, six the hydroacoustic and one the infrasound technologies. The latter (infrasound station) was located within proximity of the Diego Garcia military base in the Chagos Archipelago. The CTBTO confirms in this regard that “the first automatic event list containing the Sumatra earthquake was released by the International Data Center (IDC) in Vienna two hours after the event.” It nonetheless confirms that the “raw data from the monitoring stations” were communicated “in near real time” ( almost immediately) to national data centers of state signatories including Australia, Indonesia and Thailand. (See text of CTBTO Press Release ). The fact of the matter, as mentioned earlier, is that the data concerning the earthquake originated from monitoring stations situated on the site of the US island military base. In other words, the US military base at Diego Garcia , with its advanced monitoring facilities, research labs, etc. was not the “recipient” but rather “the source” of the relevant data regarding the earthquake. (See Table 1). 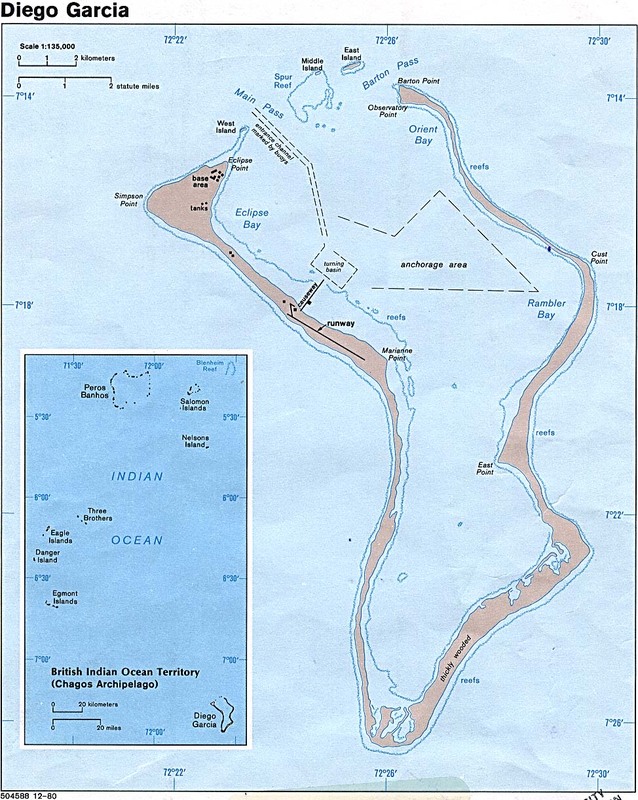 the BIOT/Chagos Infrasound Station (IS52) (located North of Diego Garcia, see map below) which “provides evidence of a possible atmospheric explosion by detecting sound pressure waves in the atmosphere”. The Vienna based IMS also had relevant information, within minutes of the M-9.0 earthquake. To date, none of the data recorded at its Indian Ocean stations has been made public, although it is normally transmitted to the signatory governments and is no doubt also available to the US military. This data could shed light on the nature of the disaster, while also dispelling speculation by some news media that the tsunami could have been caused by an underground explosion. It is therefore crucial that the readings from these three BIOT IMS stations, which are available to the signatory governments, be promptly released and analyzed. In addition to real time seismic data (as well as hydroacoustic, infrasound and radionuclide data), satellite images of the disaster on the North Sumatra coastline were also available in near real time to a number of agencies and international organizations. The data received by the NRO are relayed to a number of US government/ military bodies including the Department of Defense and the CIA. “Other sensors known as radar instruments actively shine microwaves pulses down to Earth in order to record how these pulses get reflected back up to space. These instruments measure surface roughness instead of light or heat energy, and have the advantage of being able to see through cloud and darkness. And by combining together different radar images of the same location – a technique known as interferometry – tiny millimeter-scale ground motion can be identified. The overriding issues pertaining to the warning / information systems, cannot drowned or brushed aside. They must be the object of a full-fledged inquiry, preferably by an independent body. In addition to the seismic data, the Vienna based IMS/CTBTO monitors and compiles hydroacoustic, infrasound and radionuclide data, which is transmitted in near real time from its stations in the Indian Ocean (including three stations in the Chagos islands archipelago). Moreover, satellite reconnaissance technology, not to mention the use of simulation models, have the ability to assess and monitor the speed of the tsunami in near real time. Map: Animation Simulating the propagation of the Tsunami in the Indian Ocean . 00.58.50 GMT: a 9.0 magnitude earthquake occurs on the seafloor near Aceh in northern Indonesia. 01.14 GMT: The Pacific Tsunami Warning Center in Hawaii emits its first bulletin, confirming that there is no tsunami warning in effect. 02:16 GMT (one hour seventeen minutes after the earthquake). SIO staff received notice via automatic email from the NEIC of the initial earthquake detection. 02:57 PM: One hour fifty-eight minutes after the quake, SIO staff receive request from Sri Lanka “asking whether there had been any earthquakes in or near Sri Lanka.” (By that time the tsunami had already devastated the coast of Sri Lanka). 0.3.43 GMT: NOAA log indicates that US Pacific Command, including the Diego Garcia military base, were “given a specific warning about the tsunami some two and three quarter hours after the earthquake” (The Guardian, 7 Jan 2005). Subsequent reports suggest that the Military received the seismic data in near real time shortly after the earthquake. 08.00 -11.00 GMT (according to news dispatches): East Coast of Africa is hit. Seven to ten hours after the earthquake (see animated map). 3. IMS/ CTBTO BIOT Chagos Radionuclide Station (RN66) at -7.0 S 72.0 E located at the Diego Garcia US military base. The infrasound stations provide evidence of a possible atmospheric explosion by detecting sound pressure waves in the atmosphere. Plot showing the accelerations observed at IRIS/IDA stations COCO and PALK superimposed on a figure depicting expected ground accelerations for varying distances and sizes of earthquake. While the PTWC failed to acknowledge the existence of the tsunami in its first two bulletins, the Tsunami was in fact monitored in real time by a number of monitoring stations of the National Oceanic and Atmospheric Administration (NOAA) to which the PTWC belongs. IRIS network of 128+ (often unmanned) seismic monitoring stations worldwide. World Data Center of the National Earthquake Information Center in Denver, USA. QUAKELINE: bibliographic database produced by the MCEER Information Service . It covers earthquakes, earthquake engineering, natural hazard mitigation, and related topics. It includes records for various publication types, such as journal articles, conference papers, technical reports, maps, and videotapes. The International Charter aims at providing a unified system of space data acquisition and delivery to those affected by natural or man-made disasters through authorized users. Each member agency has committed resources to support the provisions of the Charter and thus is helping to mitigate the effects of disasters on human life and property. The following Space Agencies are currently members of the Charter. Click on the name for more information about the Agency and its space resources. Provides satellite images, before and after. The images showing the progress of the tsunami on the 26th of Dec, obtained in near real time have not been released.